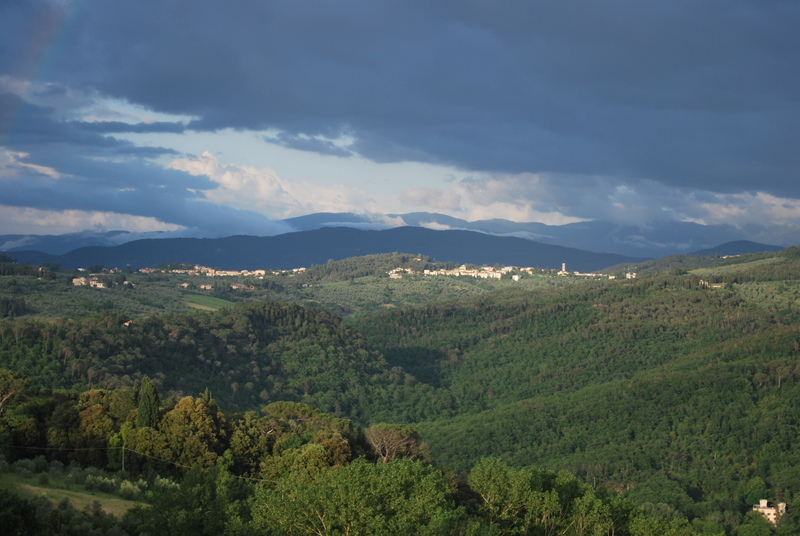 The drive to Florence was quite long, but just like our drive from Rome to Naples, it was gorgeous. After navigating Pompeii that morning we were exhausted so the downtime on the bus was welcomed. When we arrived unfortunately the weather was a bit rainy but we stopped quickly at a vantage point for photos and then went on to the hotel. This was definitely the most unique hotel we stayed in during the trip. I am not sure I could even full describe it but the décor they were going for was some kind of modern Italian. The walls around the bed were done in red tile with LED lights at each grout intersection and the rest of the walls had mirrors, which I would assume were to make the very small room look larger. Our dinner that night was a group included dinner in the hotel restaurant. I believe we had chicken, but the only really notable thing was someone in our group throwing a hissy fit because he apparently didn’t eat poultry of any kind. Just a side note, that on these tours they will cater to any dietary restrictions you may have whether they be just a preference or a medical need. They cannot do that, however, if you don’t tell them what they are, and there were several opportunities to make them known. This particular gentleman did not share his no poultry restriction with our director and then was irrationally angry when he was served chicken. She even had the restaurant bring him steak, but he did not like it either so he literally threw down is silverware and stormed out of the room. It’s always amazing to me when I see adults acting like this. The following morning there was an optional excursion but we decided to just stay back and get some extra rest. 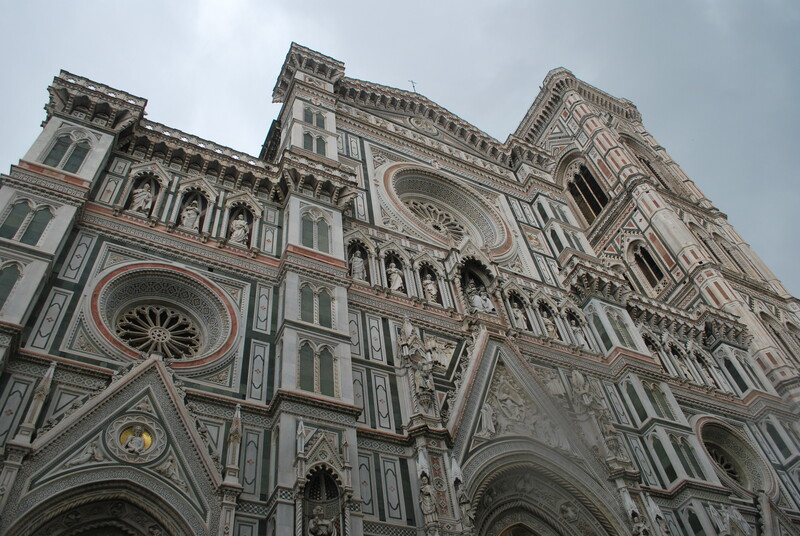 We met up with the group at noon and went to old Florence. First we enjoyed lunch where I was served the largest calzone I have ever seen, and I ate basically the whole thing. It was delicious and filled with mozzarella and prosciutto. After lunch we gathered outside of the Accademia and entered as a group to see the statue of David as well as other works by Michelangelo. 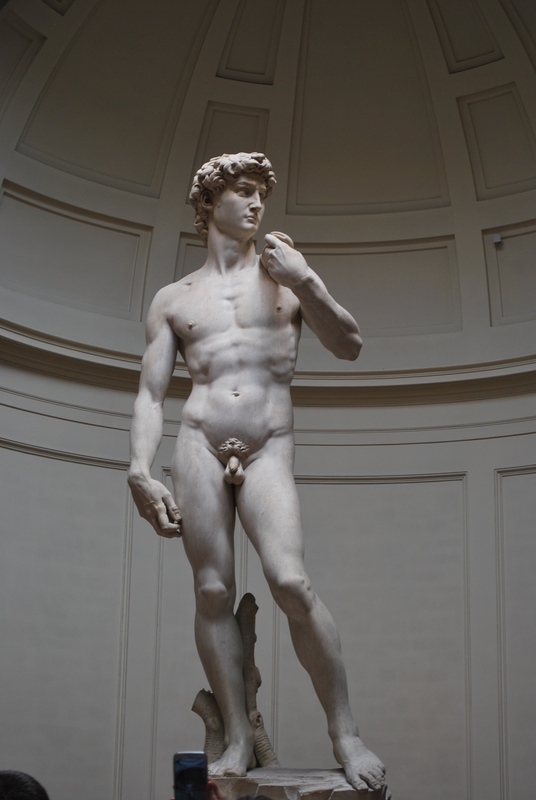 The David is very impressive and it’s amazing to think that until fairly recently the precious statue was actually outside with no protection. 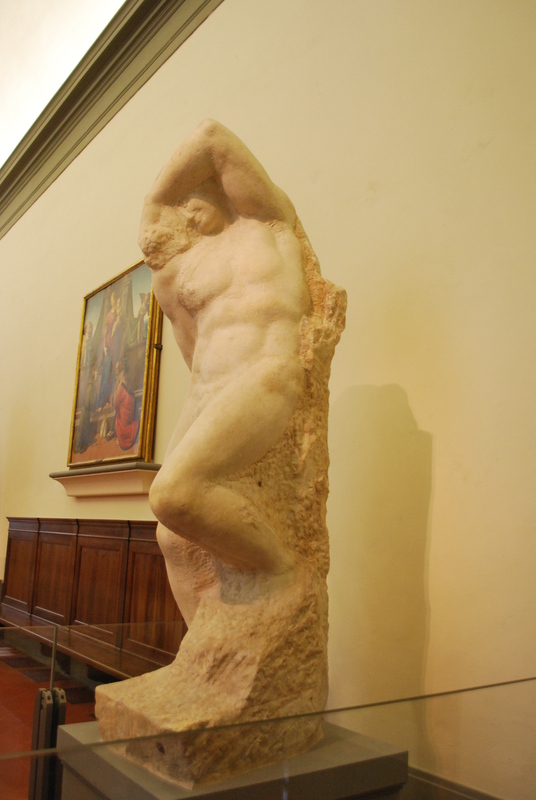 Michelangelo also crafted it out of a block of marble that had been rejected by two other famous sculptors who had found it to be impossible to carve and had thrown it away. After finishing our time in the Accademia we headed for our tour of the Old City. When we set out the sun was shining. Not 10 minutes into the walk it was pouring rain. Thankfully I had invested in a good rain jacket, but my shoes and pants were soaked. We walked through the city as the guide pointed out various things, but it was pouring too hard to actually take a photo or even enjoy it. 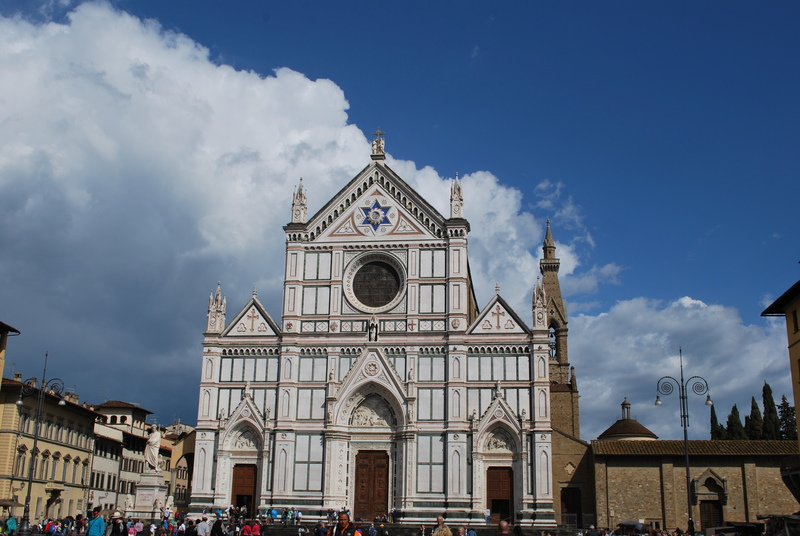 We finally got to Piazza Santa Croce and went into one of the leather stores. 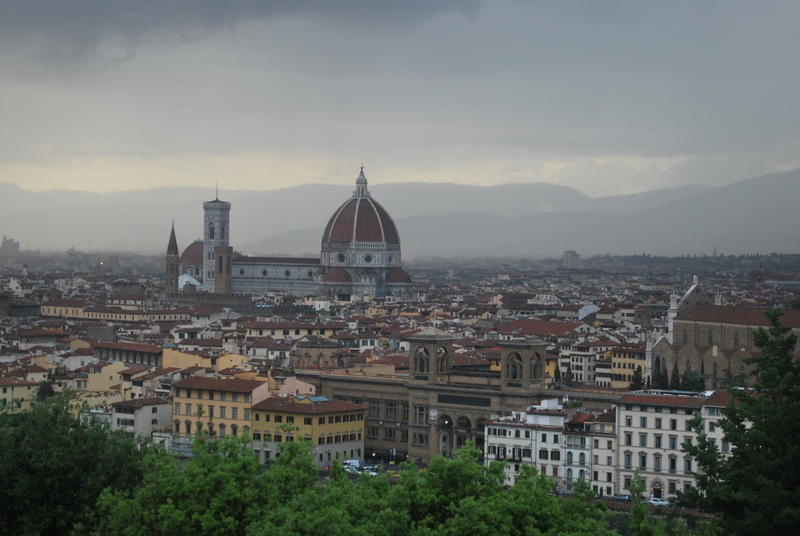 Florence is famous for its leather markets and I was able to find two very nice Italian leather belts to bring home to my husband. After wondering around the leather market we found a small café with covered outside seating to enjoy a cappuccino to warm up and stay dry. Of course the sun came out just as we had to leave. 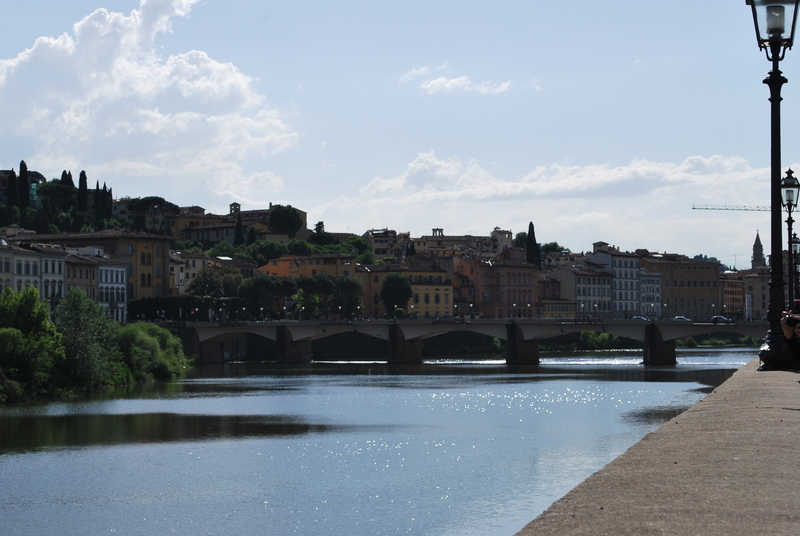 I would love to walk through Florence again, preferably in the sunshine as the buildings and sculptures are absolutely amazing. After returning to the hotel we had a short time to change out of our wet clothes and head back out to a winery in Tuscany for dinner. We were met at the winery with a cocktail reception with some very interesting sparkling wine style blue wine served in champagne flutes. It was very sweet which I usually do not care for, but this was actually delicious. Our tour director said it was made with peach juice which still doesn’t explain why it’s blue. We took a quick tour of the winery before entering the dining room. 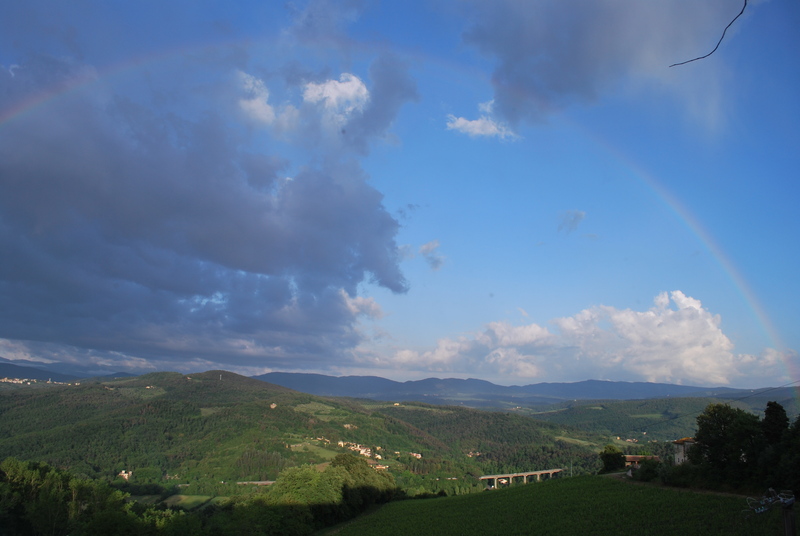 The best part was the huge windows overlooking the vineyards outside and there was a beautiful FULL rainbow! Each table had a red table wine, a strawberry wine, and a white wine. I will be honest I would usually go straight for the red wine, but the other two were actually better! The white was very heavy on grapefruit and the strawberry wine was very similar to the blue wine we had earlier. Dinner was AMAZING. 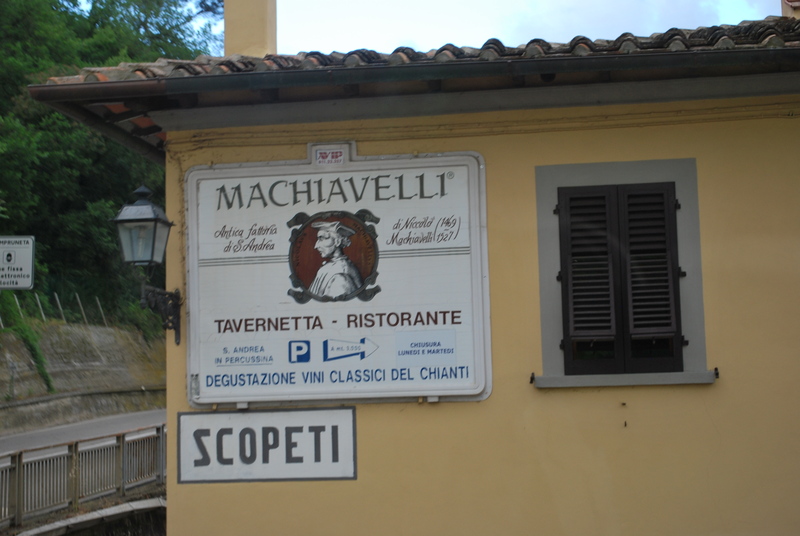 Some of the best food I had on the trip. 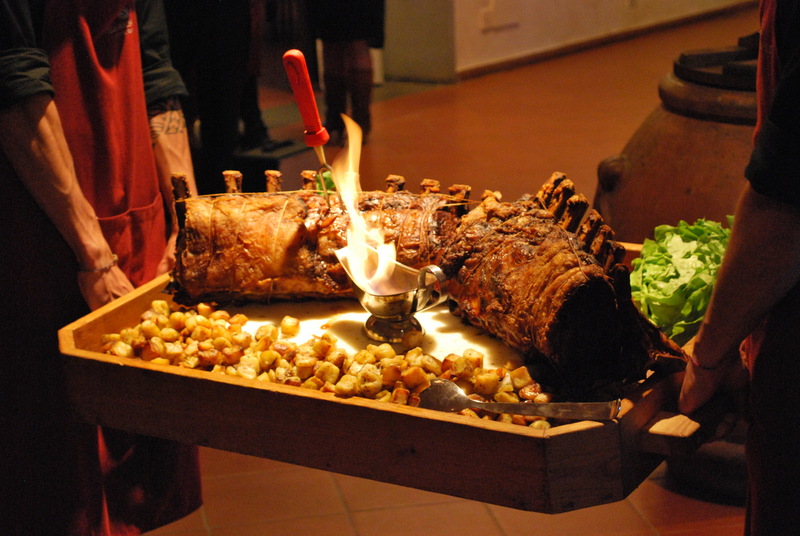 When the main course of steak and potatoes was served they also served a Chianti which was very good. As we dined there was live music which was really fun. The whole night was great. 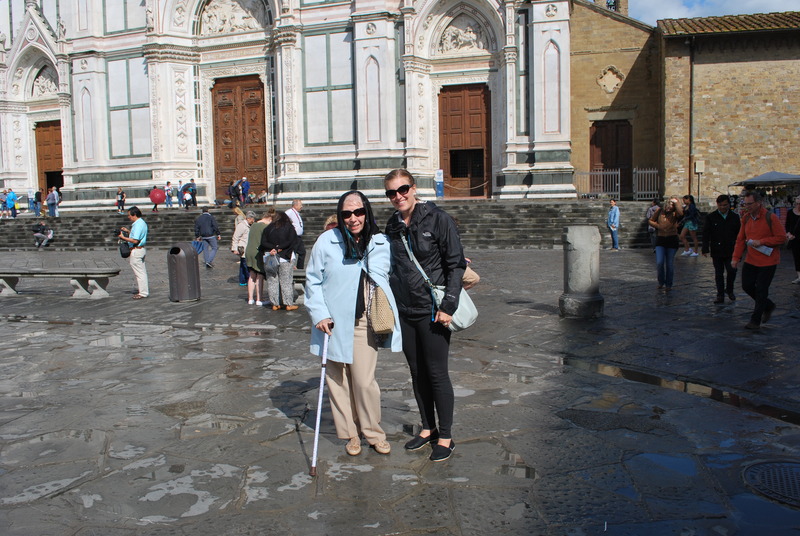 The next morning was of course an early departure but we were on our way to the Cinque Terre and Italian Riviera! 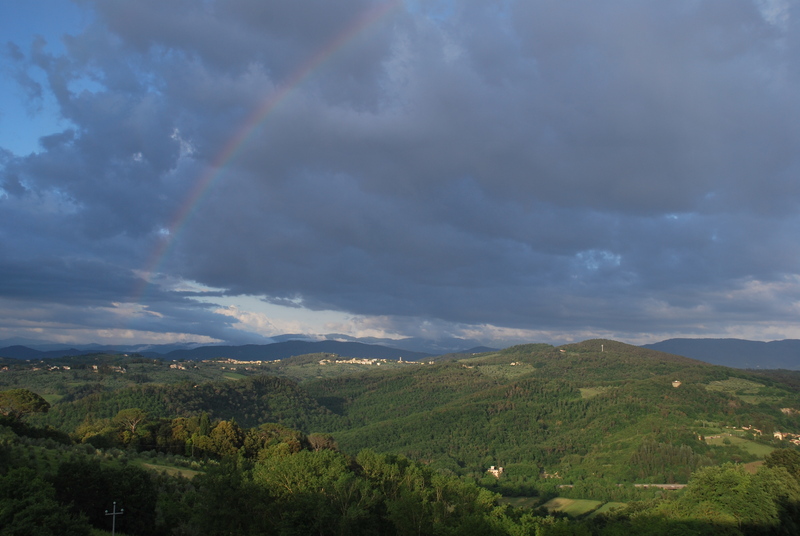 Views of Tuscany with a rainbow! 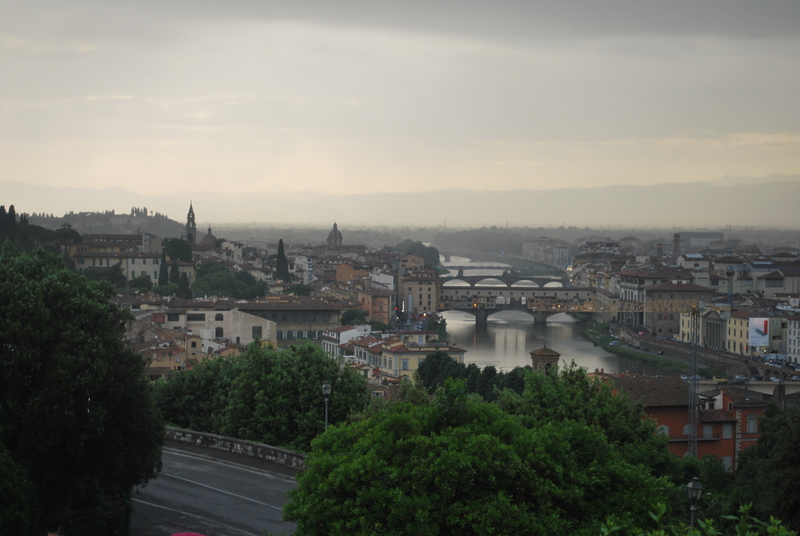 When I was in Italy Florence was my favorite! Also that guy is the reason that most of the world hates Americans…. uh yeah it was ridiculous. Even if she had been aware of his whole no poultry rule and they had messed up it still is not an acceptable way to act. Exactly. When we were there they served us (a group of college kids) salmon with all the bones and the head and everything. We had NO IDEA how to eat it, but we all did the best we could because we didn’t want to be insulting! Then, if I remember correctly we thanked them so much for the delicious meal, left to do our sightseeing, and grabbed food from street vendors. And again, we were college kids and we knew how to act!